Kros-Wise is a professional services and product development firm founded in 2004 with 150 full-time employees. The company headquarters is located in San Diego, California and Kros-Wise is a Woman-Owned Small Business (WOSB). Kros-Wise has extensive experience providing support to IT Programs for US Navy and other US Government Organizations, and to aviation and satellite equipment and service providers. Their team is highly experienced in IFE-C systems, service, installation design and support, and the associated FAA/CAA certification. 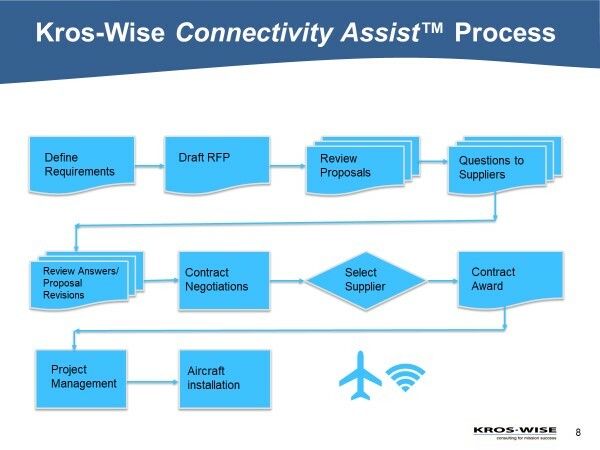 Kros-Wise has assembled a team with 200+ years of combined experience in the commercial and military aviation arena and have developed standardized processes and solutions for connectivity and certification engineering. One of our offerings is Connectivity Assist which was created to aid decision-makers with vetting through the increasing complexity in IFE-Connectivity landscape and rampant confusion over “disinformation” in the IFC market. Our Connectivity Assist experts weave through the source selection process by using our intelligent connectivity analysis process. We can assist the customer in defining their requirements, drafting RFP’s, analyzing supplier proposals, clarifying any questions, and assisting in the selection of suppliers. After contract award, our Airline Representation Project Management (ARPM) team can represent the airlines during the system installation process and with conducting aircraft surveys in preparation for installation. We can also oversee schedule and performance of the aircraft installation. Our goal is to partner with our clients as an “Honest Broker” and provide a successful contract execution. Realizing that airlines require assistance with the IFC selection process, Kros-Wise has assembled a team of highly experienced staff and developed a disciplined process which can cost effectively help the airline ensure that they make the best decisions. We call this process Connectivity Assist™. Utilization of this process can save airlines millions of dollars over the term of their IFC contracts. In order to accomplish the IFC supplier selection process in an efficient and timely manner, Connectivity Assist™ uses a structured process which is summarized in the diagram.